The Dutch Room was founded by Denny & Anita Madden at our current location in 1974. Always known as a home town bar and grill with top notch Pizza, Burgers and Wings - as well as home made soups and sandwiches by Tina Madden. Denny and Anita have now handed the reigns to Brandi (granddaughter) and Gabe Miskovich. 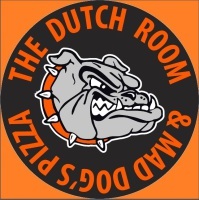 The next generation vows to continue to provide excellent food and service that The Dutch Room has always been known for!! With on going renovations, big screen TVs to watch sports and out of this world food, it's the perfect place to meet up with family and friends! Our favorite spot to eat and hangout in town! Love the food and atmosphere! This place is awesome!!. Nice big flat screens to watch a good wild hockey game on. The food is great and the help is even better!!! One of my favorite places to hang out. Best wings around!!! We had them cater..wings, pizza, deep fried cauliflower,mushrooms, caesar salad!! Everyone loved it! Thanks Brandi N Gabe! A Success!!!! Love the food and it's always been one of my favorite bars! Good times guaranteed!!! Today we had pizza and wings delivered to our work place. I had a gluten free veggie pizza. It was one of the best pizzas I've ever had! !